What is the difference between the English Track/Master of Arts and the 4-year Character Animation and Animated Filmmaking programme? 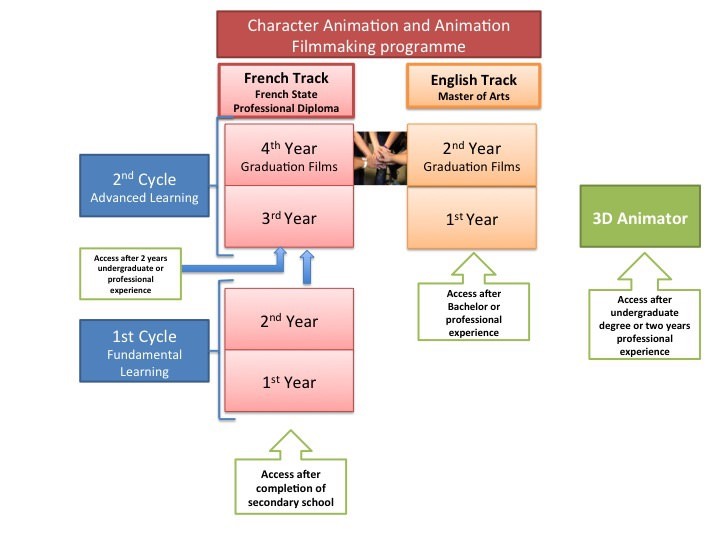 The 4 years Character Animation and Animated Filmmaking programme is in French. Students enter in the first year after they secondary school graduation. They have to pass a competitive examination to enter and progress through the 4 years. The English Track has exactly the same programme than the 3rd and 4th year of the French programme. Students enter with a Bachelor or after three years of professional experience. The programme is taught entirely in English. During the 4th year, students from the French programme and students from the English track will form together the teams for the production of the end of studies films. The chart below explains the offer of GOBELINS, in terms of diplomas and degrees in Animation. Is the programme ECTS credited? Yes. The programme is divided into modules that are all ECTS credited. You will get 60 ECTS credits per year.